It’s taken a decade but a skittles team from Cardiff have finally clinched another major skittles title. 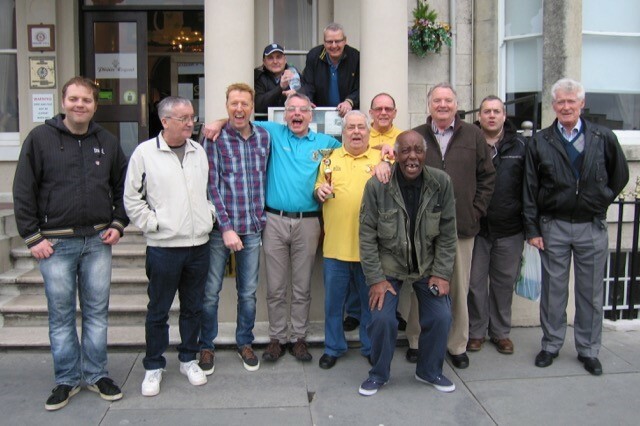 The team, called Norfolk n Chance, travelled to Weymouth in Dorset where they beat off opposition in the form of 11 teams from Ross on Wye, Calne, Gloucester, Penarth, Stroud, Cardiff, Weston Super Mare and Bristol to win the weekend tournament. The team, renown for their chanting, did enough to get through to the finals but weren’t expecting to win. ‘We didn’t have any really high scores but we were consistent with some high 40s,’ said team captain Gaaarry Duffy. In the finals, they faced tough opposition from the Crackers from Bristol, Odds & Ends from Gloucester and the Dirty Dozen from Stroud. But their consistency paid off. Norfolk n Chance edged ahead finishing up with 388 points, six ahead of the Dirty Dozen to lift the trophy. The team gets together to compete annually in the tournaments organized by Serious About Events based in Torquay who also organise the Butcombe British Skittles Championships. Last time they won was in Torquay ten years ago. Last year Gary won the highest scoring man trophy in Sand Bay, Weston Super Mare with an impressive individual score of 63 points. Norfolk n Chance celebrating their win.